Though Buddhism discourages the consumption of alcohol, Thailand has an established drinking culture. Liquor is cheap and readily available. Drinking on the street may be illegal (at least in Bangkok) but it's not uncommon. This setup in Chiang Mai isn't in a bar. It sits streetside at the entrance to a sundries store/laundry on busy Charoen Rat road, just opposite a wat. No need to take a seat; this is booze on the hoof. Name your poison, throw back your shot, hand over 20 baht (about 50 US cents), and be on your way. Drinking is such an ingrained part of Thai culture (at least for males) that the country is the fifth largest per capita consumer of alcohol in the world. There's a dark side, of course. Drunk driving is a severe problem in Thailand, especially around Songkran (the Thai New Year). Over the course of this three-day holiday Thai newspapers maintain a running tally of traffic crashes and road deaths (the latter regularly exceeds 600). The Thai government estimates that at least 70% are alcohol-related. You couldn't pay me to take a roadtrip in Thailand over Songkran. There's even a category of Thai dishes, called gap klaem, meant specifically to be taken with alcohol. Gap klaem privilege salty, spicy, and sour flavors over sweet. Examples include semi-dried spiced beef (nya dtaet dtiaow) and sour fermented pork sausage (naem). Gap klaem aren't heavy or rich dishes, just substantial enough to sop up liquor and lend the drinker stamina. 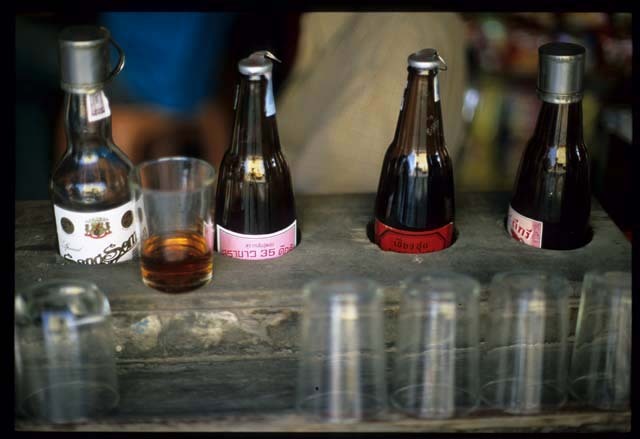 For Thais, drinking on an empty stomach is anathema; a long evening of whisky and sodas will also involve the consumption of a steady stream of gap klaem. One of my favorite gap klaem - which in fact I rarely consume with alcohol - is an addictive salty and slightly greasy mix of cashews and oil-crisped kaffir lime leaves, dried chilies, and garlic or shallots. It's sold in clear plastic bags at Thai markets and the odd stall (as of a year ago a wonderfully zippy version was being sold out of a small waxed meats booth at the 'Central' station of Bangkok's Skytrain), but it's easy enough to make at home. It keeps well, but is best stored in the fridge if you live in an area of high humidity. This recipe is open to interpretation (and doubles well, as long as your pan is big enough); amounts listed are mere suggestions (I like to err on the side of spice and perfume - chilies and lime leaves). Peanuts are sometimes used instead of cashews. If you don't want to deep-fry the nuts you can roast them (or substitute already roasted, unsalted nuts - heat them in the oven before mixing with the other ingredients) instead. Deep-fry separately cashews, chilies, lime leaves, and garlic. 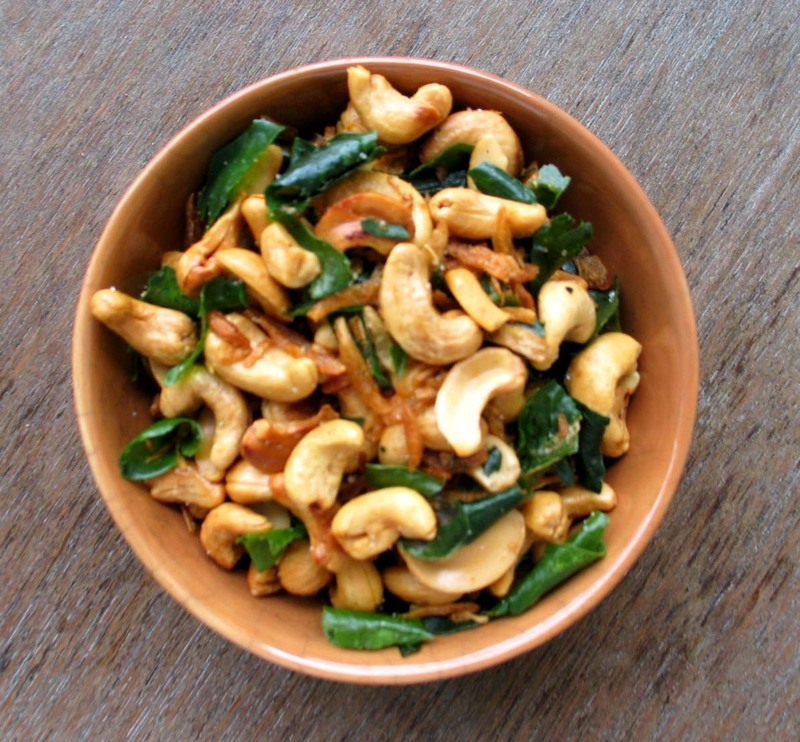 (Or, chilies, lime leaves, and garlic can be separately shallow-fried and cashews roasted.) Be careful not to let ingredients burn; nuts should be lightly browned, chilies dark red (not black! ), lime leaves curled and crispy, and garlic/shallots deep gold. Drain on paper towels and mix ingredients together while they are still warm. Add salt to taste. Let cool and store in a sealed container. Now how can it be I've gone so long without discovering your wonderful blog, hmmm? This snack dish looks fantastic, and armed with a kaffir lime tree in my backyard as well as plenty of booze in the kitchen, I'm going to make this immediately. Thank you! I'll be a regular reader from herein. Yay, I've gotten a comment on one of my Thailand posts! Thanks for the compliment Evil. Or, would that be EJ? Cheers! Yes, Robyn. I have tried this gap klaem with beer and it was superb. Surprisingly, I did not know that it was called gap klaem until I read your post. I suppose there is a less spicy version produced by the Indians in Malaysia but again, being terrible with names, I wonder what it's called. It goes well with beer too and is sometimes served in the pubs. Hi bayi - this treat is not called gap klaem, that's the general terms for all dishes/snacks that are considered "drinking food". Hmmm...not sure what this is called, come to think of it.